Adorable 3br/2ba, two-story cabin with spectacular views from every room! It is located minutes from great restaurants, shopping and golf. There is a popular marina just across the water way that rents boats, water crafts, kayaks & paddle boards. Ideal for the whole family. Deep water for floating, swimming or jumping of the dock. Located in a large cove area with low boat traffic that is great for paddle boarding, tubing, skiing, or wake surfing. 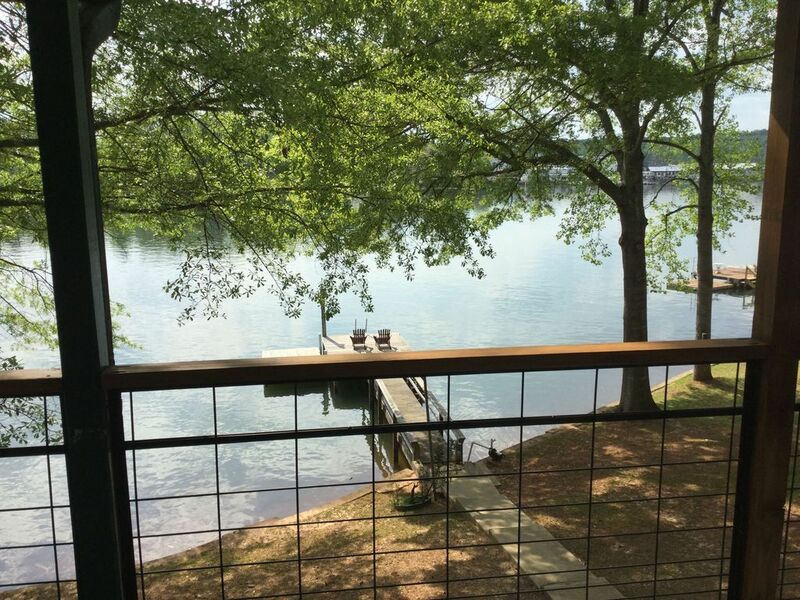 Don't miss out on all the Lake Martin fun! The three upstairs bedrooms all walk out to a balcony perfect for taking in sunsets with a glass of wine or having a quiet morning coffee. Two bedrooms contain queen size beds with high quality linens and handmade blackout curtains and bed skirts. The third bedroom is a bunk room with two single beds and a bunkbed with a full sized lower bed and a twin upper. All three bedrooms have TVs with cable and Wi-Fi access. The upstairs decor is a casual rustic mix of reclaimed, up-cycled furniture and accessories . The upstairs bathroom is a combo tub and shower which services all three bedrooms. Bed linens, towels and beach towels are provided. The downstairs is open concept with kitchen, dining room & den that all share a perfect view of the lake! The kitchen is complete with all the necessary amenities (refrigerator with ice maker, dishwasher, electric stove/oven, microwave, coffeemaker, blender, crock pot, basic dry goods, paper goods and dishes)& has a 2 seat bar. The dining room has a six person dining table with leaves that can make it accommodate 8 to 10 people. Combined with the kitchen bar, 10-12 people can easily be seated to eat inside. The den features a big screen smart TV that has cable, amazon prime and Netflix ( you have to log into your own account). The comfy seating can accommodate a crowd around the tv or the gas fireplace. The downstairs has a covered porch with comfortable seating, outdoor dining and grill. A cement walkway gently slopes to the cabin's private pier. The water is deep enough to accommodate a boat and jet skis as well as recreational swimming from the pier. This cabin also has a unique feature in that it has an upstairs entrance to unload suitcases and a downstairs entrance to unload groceries with tons of paved parking for you your family and guests. To keep our home beautiful for your enjoyment, a cleaning fee of $175.00 is charged per reservation; which also includes one set of linens and towels. There is a 4% Booking Fee and a 4% Tax Rate.